I used the colours from this week's Inkspirations Challenge. So pretty. I am not quite ready to say goodbye to the oh so lovely Bliss (Sale-A-Bration) set yet. I love the flourish, flowers and butterflies....oh you know I love it all!!!! I clear embossed the flourishes onto the middle Perfect Plum panel. The butterfly is also clear embossed. I stamped the flourish behind the sentiment in Blushing Bride and then embossed the sentiment on top of it. All of the Sahara Sand and Very Vanilla cardstock are sponged in Sahara Sand ink. See you back here soon.....I promise. Wow, you have put alot of work into this card. It is so pretty. 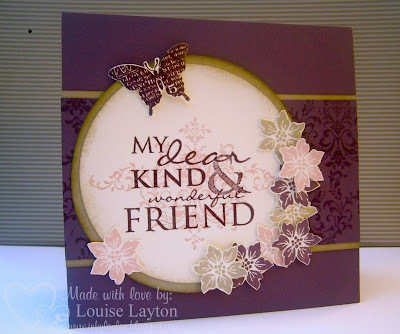 Love the flowers and butterfly and the flourish behind the sentiment looks perfect. Great inspiration, thanks for playing along with the Inkspirations challenge this week. That card is just divine, I love everything about it!!! I love the Bliss set too but haven't done much with it, too busy making b'day cards for all my friends kids. Also the reason for not getting to play in this week''s challenge even though I LOVE the colour combo. I channelled you yesterday and made a name sign for the little guy who lives across the road. Congrats on 'Honourable Mention'. I actually had you pegged as winning as it was such a fab card!!! !